&Other Stories hasn't landed that long ago in Belgium (the first store in Antwerp opened just last May), but the cult status of some beauty of their products was already well established here long before that. Punk Bouquet is a well loved permanent scent, while I also hunted for Equatorial Dreams after having smelled the scent for the first time in their changing rooms in the first London branch. I was wishing for the addition of scented candles not too long ago - and also those have been added to the permanent range. Their makeup is also quite nice, as are some of their brushes. The brand is doing really well in the cosmetics and beauty department! During my most recent shopping trip to Antwerp I discovered their cotton range (see the store line-up in this Instagram) & fell in love. I'm a sucker for anything that smells like fresh bedding sheets (think Philosophy's Pure Grace eau de toilette, Yankee Candle's Fresh Cotton candle, ..) and this is exactly that - across a whole range of products! 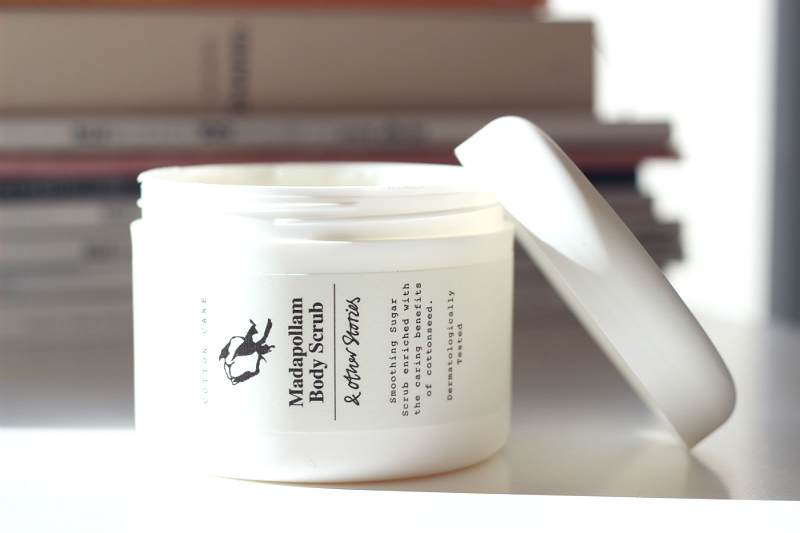 So needless to say I was super happy to be gifted this delicious Madapollam Body Scrub from the Cotton Care range; this one won an ELLE Sweden Beauty Award this year and it's definitely well deserved! Let's talk about this heavenly scent first, which is described as 'succulent peach surrounded by a rich floral soul with a hint of plum.' While I'd never describe it that way - I'm bad with that type of thing - I'd totally add it to the cotton scented group of products by just smelling it & without knowing the name. It's a very light and clean floral scent, a bit warmer perhaps than Philosophy's Pure Grace although it comes pretty close. 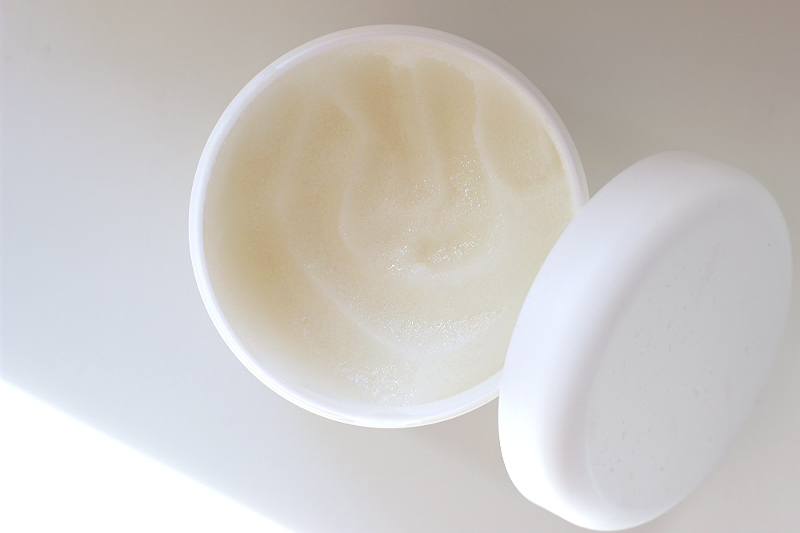 The formula is every bit as amazing: a thick rough sugar scrub that melts to a soft syrup when mixed with warm water. The scrub is effective but not too rough when used wet (I wouldn't use it dry as it's a little too textured for it), and while scrubbing you'll notice the formula to soap up a little. The cottonseed oil added to the formula makes sure your body does not dry out after scrubbing, but is left beautifully soft and as &Other Stories says it themselves 'with a silken texture'. The scent lingers on all evening/day, and my skin feels smooth for days in a row. All this at just €11.00/£9.00 for a jar of 300ml... This scrub just made it's way to number 1 on my body scrub list (sorry Clinique - you've moved to #2) and I'm pretty sure that it'll stay there for a long time as it's that good. A re-purchase in the making! The Cotton Care range holds a variety of products such as this body scrub, hand soap, shower cream, body lotion and more. There are even little travel sizes to take with you during the holidays! This range is a tad more expensive than the regular &Other Stories body range that comes in different scents, but it's definitely worth it.